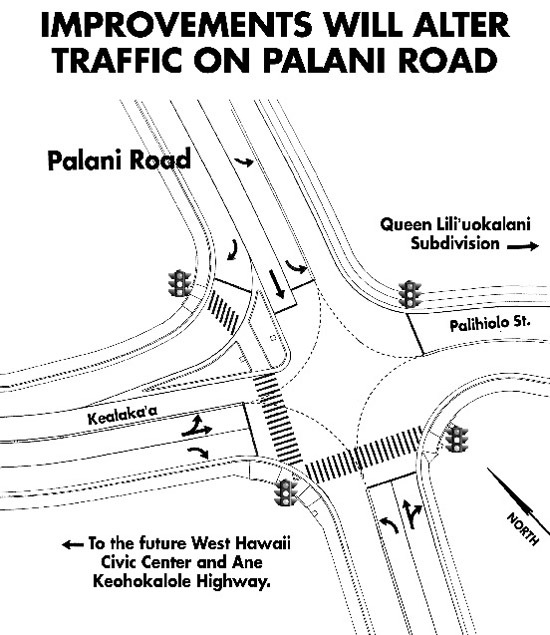 The county’s plan to activate the traffic light at Palihiolo Street on Thursday, June 3, signals the end of work on improvements to Palani Road near Kealakehe Elementary School in North Kona. The $8 million in improvements at this intersection are expected to alter and improve the flow of traffic on Palani Road, one of North Kona’s busiest streets. Palihiolo Street will again be open for use to residents of Queen Liliuokalani Subdivision, and motorists on Palani Road will have a traffic light, left-hand turn lanes and merge lanes to facilitate a better flow of traffic. In the past 36 months, contractor J. W.Glover Inc. has extended Kealakaa Street approximately 900 feet to meet this new intersection with new sidewalks, street lights, curbs, crosswalks, gutters, drainage and guardrails. Several utility poles for electricity, cable service and phone lines were relocated and re-wired to accommodate the new intersection. Nearly three-fourths of the project’s estimated $7 million cost will be funded by the Federal Highways Administration; the County will pay the remaining $2.2 million. “The traffic signal, turn lanes and related improvements are expected to facilitate the flow of traffic at this intersection, especially during the school year, and improve safety for all motorists negotiating this intersection or traveling mauka/makai on Palani Road,” said Warren H.W. Lee, Director of the County Department of Public Works. A flashing pedestrian signal at the end of the Pedestrian overpass will help students cross Kealakaa Street safely during school days. * Installation of a new water reservoir by the County Department of Water Supply adjacent to the existing water tank just makai of Queen Liliuokalani Subdivision. This 1 million gallon reservoir will serve 138 residents. * Installation of sewer lines in Queen Liliuokalani Subdivision by the County Department of Environmental Management. The sewer lines replace a gang cesspool system and will be tied into the Kealakehe Waste Water Treatment Plant. Completion is scheduled for 2011. * Construction of the Ane Keohokalole Highway (mid-level road), extending from Henry Street to Kealakehe. This $35 million project is being funded by the American Recovery and Reinvestment Act.